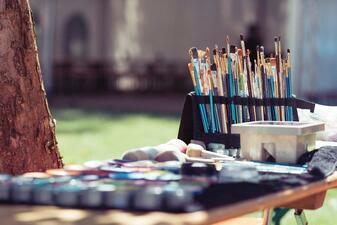 An Occasion for the Arts celebrates 50 years Oct. 5 through 7 in Historic Merchant's Square in Colonial Williamsburg. The weekend begins Friday evening with the Kickoff pARTy presented by CultureFix. Live performances are held Saturday and Sunday on two stages, and the popular food court provides a wide selection of culinary options from barbecue to street tacos. An Occasion for the Arts was founded in 1969 to provide Williamsburg with an arts extravaganza. Since then it has grown, year by year, to become the area’s premier art and music festival. We are especially proud to draw outstanding artists from around the country on the first weekend in October each year. We are equally proud of having an exceptional youth component to the show. We provide space for talented young people to display their work, but a stage to perform and, in partnership with Williamsburg Contemporary Art Center, a place for young people to create their own artwork. Visit https://aofta.org/ for more information. An Occasion for the Arts...just another reason why we love where we live!